Your Branson Real Estate Experts! When you fly into town for a vacation, all you want to do is get there is get to your room, relax, and plan your vacation for the coming days. The last thing you want to do is drive 45 more minutes to get to your destination.When you come to Branson, that is no longer the case. Branson Airport was developed in May 2002, along the Branson Creek development, 10 minutes south of Branson 76 strip. To make things even easier, Southwest Airlines just announced that they were to start flights to Branson airport early 2013. Branson Airport currently has eight non-stop flights, and over 100 cities with one stop connecting flights. The airport is hoping that teaming up with Southwest, one of the largest low cost airline carrier, will get more people interested and excited to come to the Tri-Lakes area. The Airport is not like any other I have visited. It is a small terminal, that somehow captures the Branson Tri-Lakes feel. The decor is beautiful and feels that you have left the big city life behind, and like you are revisiting your hometown. You feel right at home the moment you set your foot on the ground. The staff is wonderfully pleasant, and ready to offer you any advice on shows to see, where to stay, and where to eat. And for your convenience, there are many things located in the airport for your convenience. 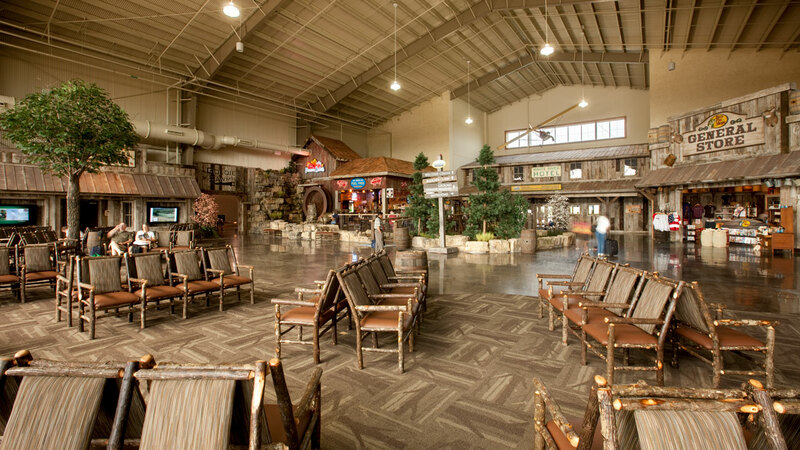 They have Famous Dave’s award winning barbecue, General Store, Enterprise car service, ticket booths for Branson shows, lodging packages, and a taxi service to take you anywhere you need to go. Branson Airport is a wonderful addition to a wonderful town. With many direct flights, and even more to be added to the board in 2013, it is a fantastic development for the frequent traveler. If you are always on the go, and wanting to live in the Branson area, never fear! This airport is the easiest and most versatile one that I have ever had the pleasure of being in. Click here to book your next visit, and feel free to stop by! We hope that you all come out to see us! Living in Branson Missouri all of my life has really been a blessing. You do not find a place where people look after one another, help out strangers, and are always willing to give directions to a lost tourist anywhere else. Branson Tri Lakes area has always been family value based; from the school systems all the way down to the shows in the area. Getting into the real estate business here in Branson MO was very important to me, because I want to be there to help people find a home in the best town to live in the US. The Branson Tri-Lakes area has many many things to offer: Shows, Beaches, Lakes, Entertainment (mini golf, Silver Dollar City, water parks, and much much more!) Family Values, and a safe Place to Make a Home. Our sense of community is something that makes living in Branson so special. Events from Relay for life to the Craft fair in the fall gets the community involved and brings everyone closer together. Having these things at your disposal and being only a short drive from Springfield MO, makes living in the Tri-Lakes Area so convenient. Real estate in Branson is a steal for the price, whether you are talking about buying a house or property. The market in the Tri Lakes area is booming, and there is no better time to buy than now! Houses Under $100,000 in Branson Area! Sellers say to me, ‘I can’t be bothered to do all of this stuff.’ I say, ‘You know what? The buyer can’t be bothered either.’ So if the seller can’t be bothered to do all of these things, why should buyers trade their old houses for your old house? There are lots of other options out there. It’s a very competitive marketplace,” says Christine Rae, owner of Certified Staging Professionals (CSP). Most people go in with the mentality that they should not have to work to sell their houses. Although we do all live in a digital world where people can virtually tour our houses through real estate sites, there is still a high demand for open houses. You, as the buyer, need to do more than let the pictures sell the house. People like to both see the house through a digital and physical way. When the time comes to show your house, follow these tips to help ensure that you are ready to show your house at its best! Set the mood. If you have a quality sound system, set the music to play in a loop before you leave. Make sure it is a easy listening music, preferably without words. Setting the mood for the buyer when they walk into your house will help the buyer put themselves into your shoes and see themselves relaxing in the space. Keep the kitchen clean, and free of potent smells. If you know you might have a showing at anytime, make sure that you do not cook anything the night before that might leave a lingering smell in the house. Although some buyers have been known to stick cookies in the oven if they know they have a showing that day to get that homey feel. Keep counters uncluttered, sinks and drains clean and fresh. People look at bathrooms and kitchens with the highest scrutiny, and so should you. Take out any personal items. I was watching HGTV, and I heard a very interesting tip in a short 30 second sell your home clip. They mentioned that you should take out any family photos, children’s art on the fridge, and personal care items out of the bathroom. You want the buyer to see themselves your house. Taking away all the family photos takes the vision away from you, the seller, and puts the buyer in your shoes. This will help the buyer feel a connection with the property. Keep it Neutral. Use a palate that is not bland, but is easy to change if the buyer decides they want to renovate. A beige wall is more welcoming and relaxing, as opposed to a neon green wall. It is amazing what a fresh coat of paint can do for a room. Pet Proof the House. If you have any pets, especially indoor, make sure that you clean the pet hair from all of the furniture and floors. Some people have allergies, and would be immediately turned off if they can not stop sneezing during the showing. Remove all pet toys, pet beds, and spots inside and out of the home. Try and get a friend to watch your dogs for an extended peiod of time, or board at a local boarding house for pets for a few days at a time. Follow these tips to WOW the buyers, and shorten your house’s time on the market! Get ideas on houses currently selling in your price range, and see is you need to add any extra bathrooms. No trendy colors. Stick to neutral, earthy, and clean colors. Cameron Snyder, president of Roomscapes Luxury Design Center in Boston says, “For resale, focus on the visuals: nice tile, nice colors, nice fixtures—and don’t spend a lot on the high-end utilities because most people can’t tell the difference.” Adding a bathroom could be the secret key to selling your home. When people walk into a home they look most critically at the kitchen and bathrooms, wanting to picture themselves in the space. Tip: Most people prefer to have a master bath and at least one powder room for guests. When you implement these tips, your home will attract more potential buyers, and shorten your house’s time on the market. Check out HGTV for even more articles! Be Prepared… Spring is on the way! Who Me… a brand new home?